Organize your slides and presentations like the pros. SlideSource.com was developed over many years working with teams in some of the largest companies in the world who need to manage a large amount of presentation content. Now these same tools are available to every presenter. In January, SlideSource celebrated its third birthday and added two thousand new users to our rapidly expanding community. Our continued growth as the industry’s best slide management system is largely due to the fact that we listen carefully to our users and continually innovate based on what they tell us. As part of this innovation process, we are currently deploying several new features, functions, and improvements that make it even easier to take control of your slides and presentations. In part one of this two-part series, we will be looking at features that help you find and organize your slides (be sure to check out the screen capture gallery at the end of this article for additional details). Using SlideSource to manage your presentation content means that all of your slides and presentations are finally located in one place. You no longer have to guess which PowerPoint file, in which folder on what USB drive, computer, or cloud server has the slide you are looking for. Equally important, each slide now has useful metadata attached to it. This metadata includes information like who edited a slide most recently and when those changes were made, as well as things like user generated comments and tags. Combining this with the built-in search function makes finding, managing, and actually using all of your organization’s slides much more efficient. 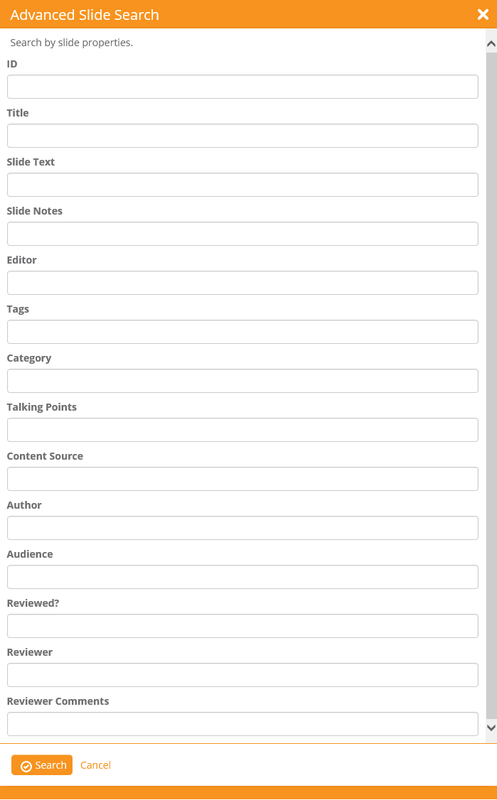 From the beginning, the SlideSource search function has been powerful – letting users search specifically in the slide title, text, or notes content as well as in the editor and tags metadata fields. 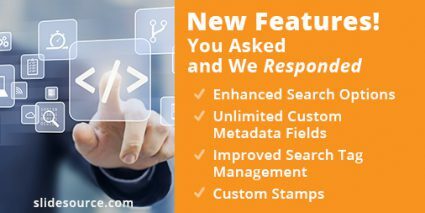 With the enhancements recently released, users can now search all metadata fields including any custom fields created by the user. 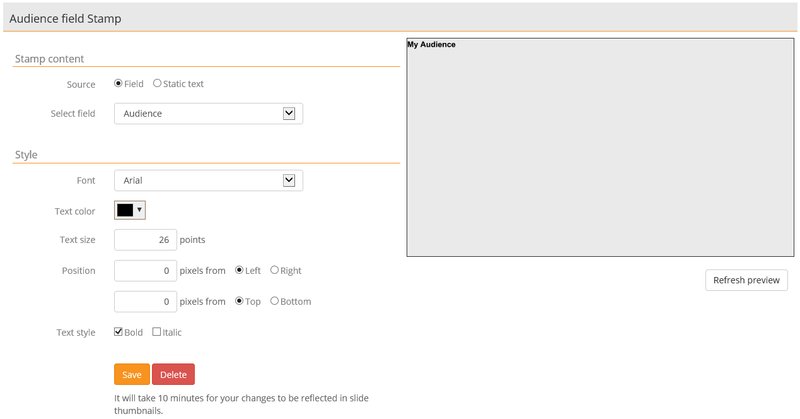 Users can now add as many custom fields as they want to the metadata attached to each of their slides. Available metadata field types include one line text, multi-line rich text, date/time, and drop down list. This is a very powerful feature that can be used in many ways. For example, you may want to have a field tracking the source of the information on the slide, or the type of content on the slide, or the date when the information presented becomes invalid, or even the slide’s intended audience. A slide in a PowerPoint file is just a slide, but a slide with your custom metadata attached becomes a valuable asset to your organization. The SlideSource search tag is a special kind of metadata specially designed to be added to slides very quickly. Our recent update makes it even easier to find all the slides and presentations in a library that have been assigned a particular search tag and the tag management interface has been improved to make it easy to rename tags across all of the slides in the library. For instance, you want to be able to easily track down a number of slides that you feel are important and give them the search tag “IMPORTANT.” However, a co-worker feels the slides are actually crucial and insists that the tag be changed. Renaming the “IMPORTANT” tag to “CRUCIAL” on the tag management page will then update all of the slides with the new tag without having to go to each slide and making the change manually. One of Slide Source’s most unique and features has been the ability to “stamp” slides with a watermark indicating the slide’s owner within the organization as well as its current status in the approval process. Our recent update has expanded this capability so that users can now create custom stamps that appear either on their slides or off to the side of the slide. These stamps are added to the slides when they are downloaded. Users can pick the font, font size, color and location of the stamp. The stamps can be used to display things like approved use information, quality control review status, unique ID numbers or even global confidentiality messages without having to open and edit every single slide. In the next post, we will review new features that will help you to keep track of what’s going on with your slides and presentations which is very important when you are working in a hectic, collaborative environment. If you aren’t already a SlideSource.com user, now is a great time to sign up for a free account and give it a try. The free subscription has all of the features and capabilities of the paid subscription levels so you will be able to see exactly what makes SlideSource.com the most innovative and useful presentation management system available. 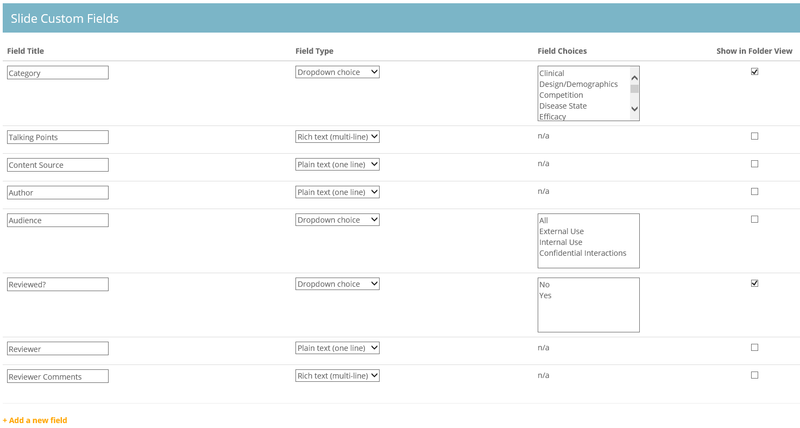 Enhanced search options: This is the search dialog box showing the many fields available. 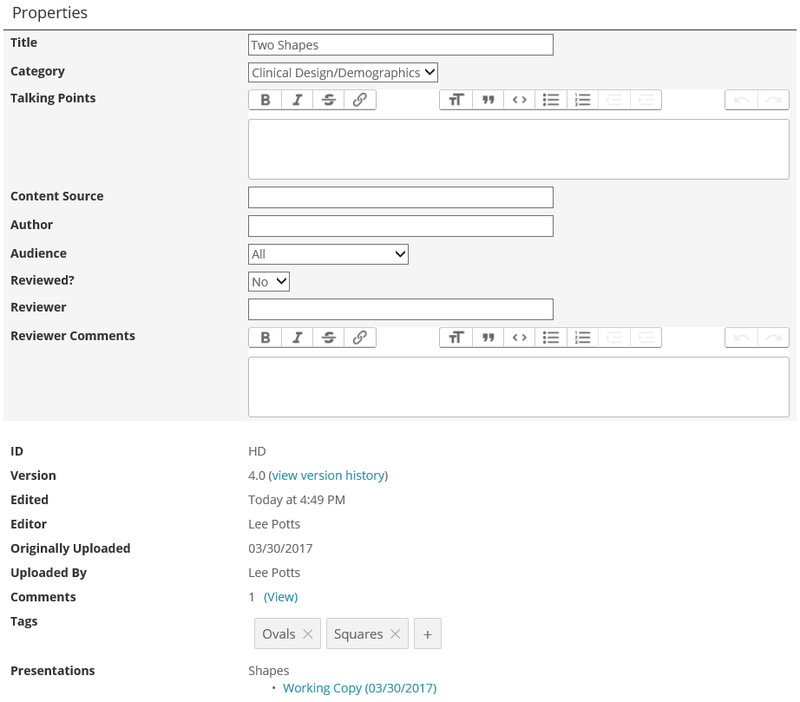 Note the inclusion of the custom, user-specified metadata fields. Unlimited Custom Fields: Use this page to create your own custom metadata fields that will help you to find, organize, and manage your slides. Note the option to have fields appear in folder view slide listings. 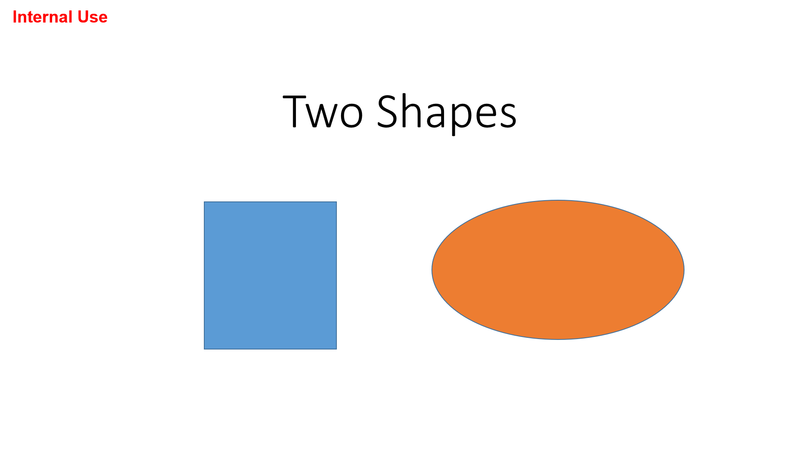 Slide Properties: Each slide in SlideSource has a slide details page. This is the part of the page showing all of a slide's properties including the default and custom metadata. This is where metadata and tags are viewed, added, and edited. Search Tags: This a the search tag section of the slide details page. New search tags are added here and if a tag already exists it will be available in an auto-complete list ("Triangles" in this case). Search Tags Management Page: Click on a tag here and see all slides with that tag. If you rename a tag here, it will be changed on all slides it's attached to. Tags are also removed here. Custom Stamps: This is the custom stamp create/edit page. Stamp can be static, user-specified text or can be dynamically generated from metadata fields. Note the many formatting options. Slides can have more than one stamp. Custom Stamps: This is a slide with a custom stamp it the upper left corner. This stamp was dynamically generated using the "Audience" custom data field.